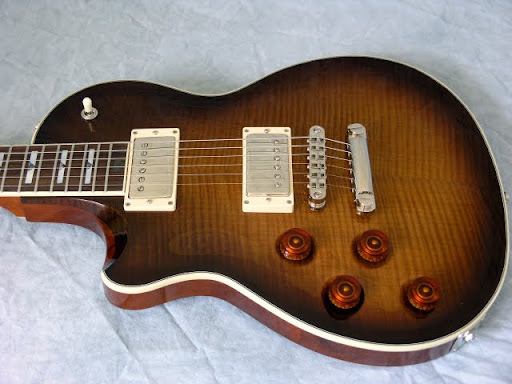 Larrivee Guitar Forum > Forum > Main Forums > Larrivee Electric Guitars > Macsmojado's Lefty Rootbeer RS-4! I have tried unsucessfully to download these pics right into the forum webpage with no luck! photo software won't let me resize them without buying a paid version of Photoshop! I gotta say the top exceeded my expectations even with the early pics that Matthew sent me! with the ROOTBEER finish even though all the colors are great! Re: Macsmojado's Lefty Rootbeer RS-4! Not sure how your photo server works but if you upload your photos to "photobucket.com" you can just copy the img code to your post here. Way to go SOUTHPAW! Thanks! Here's a donut and coffee for your efforts! I believe it is safe to say that these pics are definitely "INSTANT G.A.S."! You might as well post the rest of those from my Picasa Web Photo page! Absolutely gorgeous Macs! I might have gotten the root beer if it had have been available. My amber RS-4 will have to do ... for now. "Now I ask you very confidentially; Ain't she sweet?!" Super nice, Mac, and wait until you PLAY her!!! It's very strange to see another lefty rootbeer, with a slightly different grain in the top! It looks like yours has less "rootbeer" on the edges than mine, but it just might be the photos. Either way, she's perfect, man! 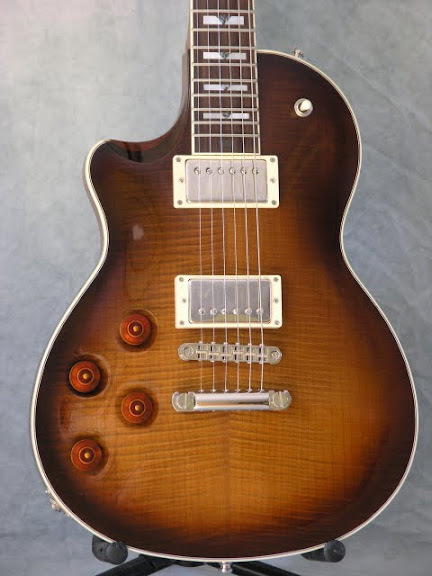 or standard finishes like the tobacco burst,charcoal burst and cherry sunburst! "Saturday" and probably more like Monday next week! I'll be posting my take on my RS-4 shortly after I have had a few days of playing it! Hope these pics induced "MAJOR G.A.S." pains for several potential RS-4 buyers! Very nice indeed. I am sure you will enjoy the guitar as much as the rest of us. my excitement about my RS-4 and posting the pictures of it for others to see! If I'm wrong please excuse my oversight! Sorry mac, yer wrong brother. I have a TB RS-4. Love this guitar and it will never leave the family, (my son likes it so I told him it's his when I'm done with it). Hope you enjoy yours as much as the rest of us RS-4 owners enjoy ours. What a beautiful guitar! Larrivee sets the standard for quality instruments IMHO. Enjoy your new RS4! I have enjoyed every minute with my GoldTop. It will always be part of the family now and the next generation. my mind! I have traded off far to many "Stellar Guitars" over the past 20 years! I can only tell you that every time I play my RS-4 I know I made the right decision to buy it...I haven't had one twinge of buyer's remorse...and like you, I've been through a lot of guitars! The sweetness of the tones this thing is capable of are truly amazing; these guitars (and the Larrivee pickups) have that special "it" that we're all looking for. That is "SWEET MUSIC" to my ears for sure! to me here in Tuscaloosa,AL! it into my Bogner Mojado! ...you must have it by now, right? 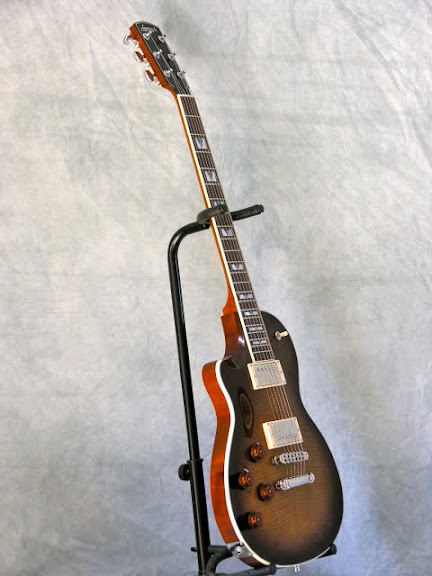 "Lord Have Mercy on Will Ray Kersey" cause this "ROOTBEER RS-4" is TOTALLY SICK! I got it today when I got home and I was completely "STUNNED" when I opened the case! He absolutely nailed it with what he said above! People you can take it to the "PROVERBIAL BANK"! to the "BEST OF THE BEST BOUTIQUE BUILT PAF HUMBUCKERS"! ROOTBEER RS-4! I don't care what anybody says in regards to the somewhat "OFF-CHARACTER"
I am going to "PLAY,PLAY,PLAY and PLAY"
this guitar tomorrow! I got 2 solid hours on it tonight for the first "TEST DRIVE" on it! 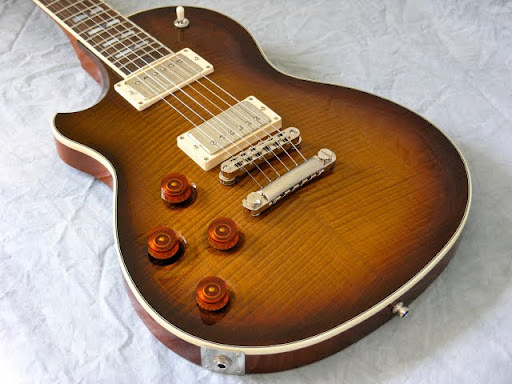 purchase what is arguably the "FINEST ELECTRIC GUITAR" that I have ever owned! ELVIS HAS LEFT THE BUILDING FOR NOW! Ummmm........don't take this the wrong way. I'm happy for you but now, like myself, you're going to start thinking about buying another one. Congrats on the guitar. I know you will love it for a long time. I still look at mine with pride when I see the detail these folks put into the instrutments they build. Mac - you truly have a spectacular looking RootBeer RS4. Enjoy it! It is a lifetime guitar. I will never part with my GoldTop RS4. However, like others on this forum, ir will most likely have some RS companions to keep it company while I'm at work setting aside for my Larrivee RS wishlist. That's what I was alluding to when I said that because yours was intended to be an amber top, it had flames all the way to the edge. Now you see what I meant.